Protect your work surface and measure at the same time. The Ek Tools self-healing mat prevents cuts, adhesives and more from ruining your surface. Perfect for 12-inch by 12-inch paper, features inch and metric measurements with 25-inch grid lines and quick guide for popular sizes. Mat closes when cut. 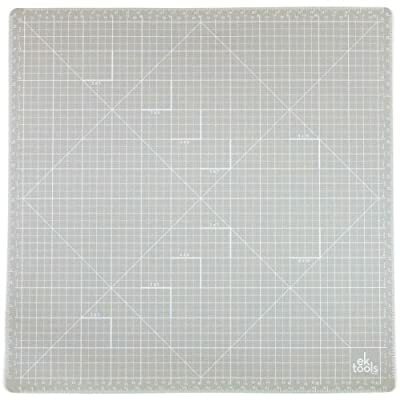 Includes 1 mat, 13 by 13-inch. scrapbookthings is a participant in the Amazon Services LLC Associates Program, an affiliate advertising program designed to provide a means for sites to earn advertising fees by advertising and linking to Amazon.com, Endless.com, MYHABIT.com, SmallParts.com, or AmazonWireless.com. Amazon, the Amazon logo, AmazonSupply, and the AmazonSupply logo are trademarks of Amazon.com, Inc. or its affiliates.